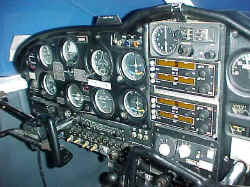 This picture shows Paul Rosales's RV6A Panel. He installed FiberLites on six 3 1/8" instruments and four 2 1/4" instruments, plus he used FiberLite labels to illuminate the wording for his switches. The lettering is now as easy to read at nighttime as it is during the daytime. Paul was extremely pleased with the results (and the economical costs compared to other lighting systems). We congratulate Paul on his winning an outstanding workmanship award at Oshkosh! This picture was sent to us by a very satisfied customer that installed FiberLites in his Piper. He was tired of flying at night with poorly illuminated instruments. He is extremely with the lighting provided by the FiberLites and the clean look of the panel. 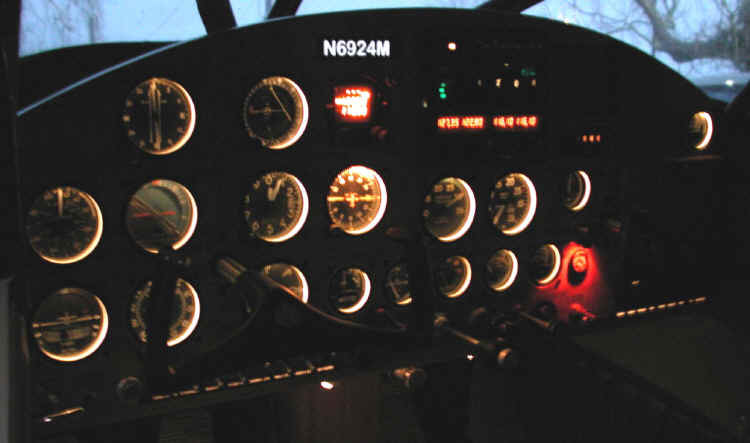 Most of the instruments on this Cessna 210 panel are illuminated with FiberLites. Two easily accessible FiberLite light sources illuminate most of instruments on this panel. SPT also manufactured a new, reverse-engraved overlay for the panel. Gene French, the proud owner of this Stinson, made his own panel with a wood overlay. He was extremely pleased with the lighting provided by the FiberLite Instrument Lighting System. 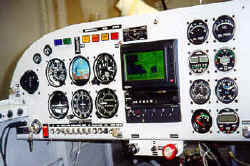 He illuminated all instruments the panel with FiberLites except for the internally illuminated ADF. It is not easy to get a good digital picture with low light, but Gene did a good job with this picture. As you can see, the FiberLites provide even 360 degree lighting around the instruments. Also illuminated are the N number and the labels for the switches. Click on this picture to see the FiberLite labels. They are backlit with fiber optics. They are as easy to read at night as during the day. You send us the distances between the center points of the switches/breakers and the wording and we custom-make labels to fit your layout. A small hole drilled through the panel allows the fiber optics to be routed back to the light source. The hole is covered by the label. 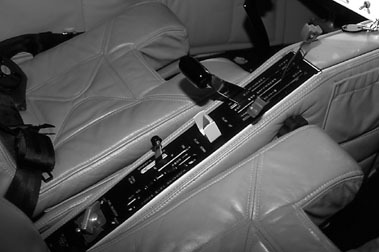 The picture on the right shows the reverse-engraved center console cover that we are making for the new Micco Aircraft that recently received certification. We were able to backlight all the wording on the console with 12 fiber-optic ribbons of various sizes. The fiber optics are illuminated with miniature remote light sources that have a current draw of only .02 amps each and a 40,000 hour rated life!! SPT is now working with several other aircraft manufacturers to light the panels of several other new designs. SPT can work with you to make a custom, reverse-engraved panel that is backlit with our fiber optics. Let us know about your lighting problems. We will work to help you solve them!